I have always loved robots. Maybe growing up reading Asimov and sci-fi movies may have something to do with it and ended up with a collection of several robot - battery operated flashing robots that made noises and moved around or even toys that looked like robots - including the popular Playskool Major Morgan, which was not actually a robot but a musical toy. I am not sure where they all went but I have not stopped collecting and still into robot, only thing is that they are a bit more sophisticated now. My daughter's birthday is coming up soon and no I am not going to give her a Frozen toy - she's just not into them. I think I might have found the perfect gift: A robot or more precisely a remote controlled robot. 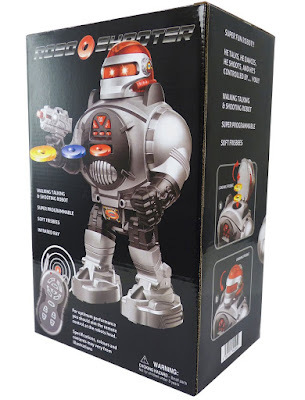 The RC robot from Thinkgizmos.com is available on Amazon.com for just $39.99 with free shipping (down from the original price of $69.99). The robot walks and talks - lines like "Freeze!" "Identify yourself or I will shoot" and "Surrender now!". You can also fire small plastic discs from it's chest when you press 'fire' on the remote and and it even dances. You can even programme the robot to do stuff on its own. 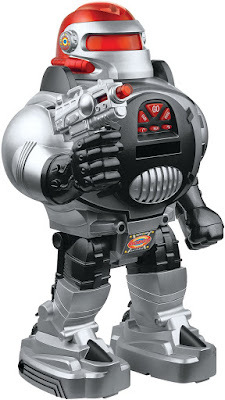 Made in China, the robot is about 30cm tall and requires 6 AA Batteries (not included). It is suitable for ages 3 and above - so great fun for everyone. If you are in Europe you can order the robot from Amazon.de. Looks like I am going to end up buying two - one for my daughter and one for myself.